Our participants are researchers with a drive to explore the future of ethnography. The CoLED network links initiatives at the cutting edge of innovative ethnographic work that takes on global themes and contributes to transnational scholarly conversations. On campuses around California, CoLED faculty have founded and driven programs that interrogate design practices, technology, collaboration and participatory methodologies, theater, digital methodologies, and filmmaking. CoLED fosters relationships among scholars and their initiatives across campuses, creating a collegial and dynamic environment for developing ethnographic and pedagogical methods, sharing innovation, and disseminating results. 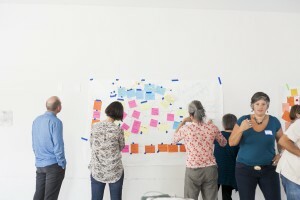 The Collaboratory is working to build a globally accessible resource for exploring the nexus of ethnography and design. CoLED was founded in 2015, and is supported by the University of California Office of the President Multicampus Research Programs and Initiatives award. Dr. Elana Zilberg at UCSD is the Principal Investigator for the grant.